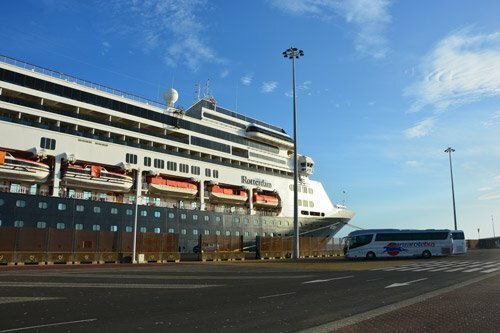 Our Lanzarote cruise port guide gives you information about the docking location, cruise dock, transportation options and much more! 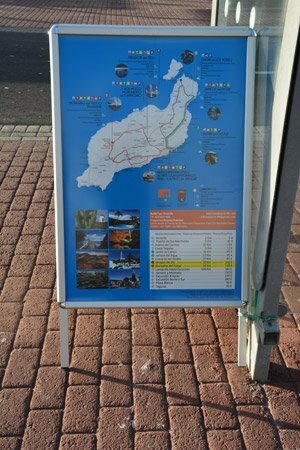 Welcome to the Lanzarote cruise port guide. The island of Lanzarote is one of the Canary islands. It is an amazing place to explore. This unique and mesmarizing moon landscape is a geological wonder. The volcanoes have shaped and coloured this landscape for centuries. The most recent eruptions from 1730 – 1736 have covered over a quarter of the island’s surface. It is just another chapter in the ongoing process and the geological formation of the island. Therefore Lanzarote is a living laboratory for scientists. The town of Arrecife is the capital of Lanzarote. It is a nice town with a small historical town and harbour. To make the most out of your time ashore we think it is best to get out of town and explore the volcanic landscape of Lanzarote. Its unique coloured landscape is filled with typical white houses and hidden treasures of art. Find out underneath what you can find on the island of Lanzarote in the Arrecife – Lanzarote cruise port guide. This is cruise dock La Boca de Puerto Naos. This pier is close to the city centre. About 1 km walk. Cruise dock Muelle de los Mármoles. This dock is located at an industrial port. Find a small terminal building (just behind the ship) at the dock with several facilities. The dock is about 7 km / 4 miles from Arrecife city center. The taxi prices are on display in port. The city centre of Arrecife is about 7 km or 4 miles away from this cruise dock. At the dock you will find a small terminal building with a tourist information point, taxis and car rentals (Cicar, Avis and Hertz). 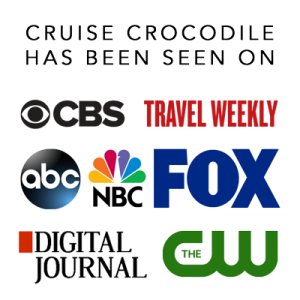 Most cruise liners will provide a shuttle service to bring you to the city centre. Taxis from this dock to the city centre will cost about 10 euro per taxi. Find more taxi prices underneath. This is the other cruise dock of Lanzarote. The dock is about 1 km away from the city centre and it is actually a nice walk. At the dock you will find many taxis. There should also be a shuttle service to get you to the city centre. If you decide to walk to the centre of Arrecife you will walk across the tourist information and many restaurants that provide wi-fi and nice drinks. These prices are per taxi, not per person. If there is one man that changed the look of the island it is Cesar Manrique. He was a painter, sculpture, designer, architect and advisor. He was determined to create an appealing character for the island. Therefore 95% of the houses on Lanzarote are white coloured houses with green, blue of brown windows. Manrique also had a great artistic talent. There are a few locations on the island where you can witness these forms are art like the cactus garden. This is one of the 2 cruise docks available in Arrecife – Lanzarote. The dock is quite far from the city center of Arrecife. You will need some form of transportation to get to the city or other points of interest. Check your transportation options in our full Lanzarote cruise port guide. The Muelle de los Marmoles is a long pier on which you will find a cruise terminal with several facilities like taxi tours and car rentals. One of the best places to appreciate this landscape is at Mirador del Río at the most northern point of the island. This is one of the 2 cruise docks available in Lanzarote. The La Boca de Puerto Naos cruise dock is the closest one to the city center. From here it is an easy and nice walk to the city center of Arrecife. You will find your shore excursion busses and taxis waiting on the pier and the tourist information center is close by. 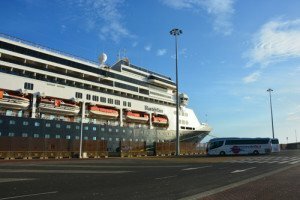 Read the full Lanzarote cruise port guide for all the information. Attention art lovers! Make sure not to miss out of a visit to the house of the greatest artist of the island: Cesar Manrique. This UNESCO world heritage site is one of the most unique places in the world. It is famous for its fire mountains. It is a line of volcanoes dominating the island. They were created in the 1700’s. The volcanoes are a living laboratory for biological research. All volcanoes are dormant except for the Timanfaya mountain. Inside Timanfaya it is about 800 degrees celsius. Either visit the national park visitors centre for a demonstration of its heat or go for a hike in this multi coloured mesmerising landscape. A Jameo is a collapsed volcanic tube. In this volcanic tube you’ll find Cesar Manrique’s decorated caves and swimming pool. Wine valley of La Geria The volcanic island of Lanzarote has a 20 square miles / 50 square kilometers unique agricultural landscape. Over 10 000 funnel-shaped hollows have been created. Each growing one vine that is covered by a tick layer of picon (volcanic ashes). This dry farming technique is a unique cultivation method for outstanding wines. Visit one of the bodega’s in La Geria and have a taste for yourself what this soil will do for the wine. Lanzarote mainly produces white wine. Check on board what your ships policy is for cork fee etc. Either way La Geria is a must to visit for spectacular views of this spectacular piece of landscape. This is the famous crater on the island. Well, it is actually half a crater. The other half sunk into the sea. 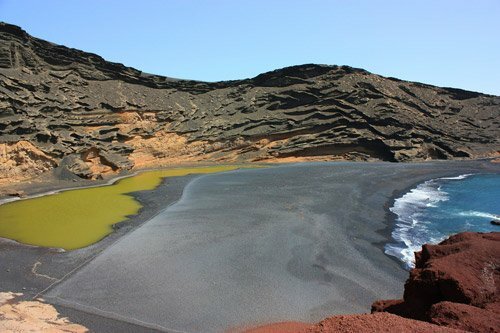 At El Golfo you will find a green coloured lake. The colours on this spot of the island create a beautiful picture opportunity.